The weather outside does not correspond to this summery slaw in the least, but we can pretend right? Besides, the sweaty sunny days of summer will soon be at our doorstep (oh happy day!) and for the folks up at the top end of the globe, I'm sure there's still a few t-shirt days left before the freezing begins in full force. I made this on the first sunny day of spring to celebrate the new season. We also busted out the marinade and braai tongs and had ourselves a braai for two on the balcony, overlooking the marvellous mountains of Stellenbosch. * There is something strangely intimate about a braai for two I'll have you know. The cats looked on in awe, as the flames danced and teased them and soon the satisfying sizzle of the meat could be heard, grilling to perfection atop the smouldering coals. I suspect heaven might feature the smell of lightly charred meat. We served our braaied beauties with a fresh and crunchy slaw, just the thing to put us in a spring-y mood. Bursting with the flavours of Asia, it was a nice change of pace from the usual coleslaw, swimming in mayo. And dare I say, ten times tastier? There, I said it. *Oh how I'm going to miss that balcony! 1. 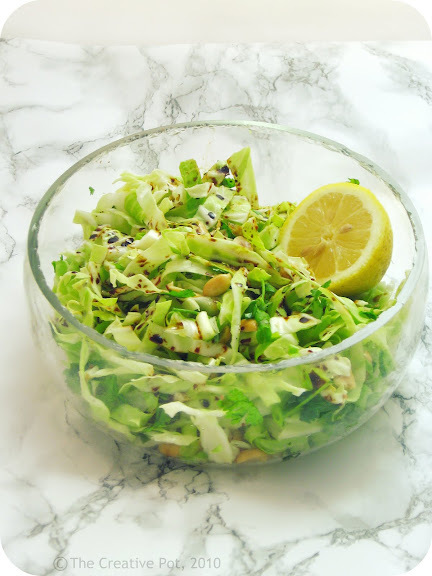 In a large bowl, toss together cabbage, peanuts, spring onion and coriander. 2. Make a dressing by combining lemon juice, sugar, oil, soy sauce and sriracha sauce together in a small bowl. Taste and adjust seasoning if needed (I find it's plenty salty enough though), then drizzle over salad and toss to coat evenly. What an innovative twist on cole slaw. It's Fall here, moving on to colder days, but I think I'll try it anyways. I bet it will taste spectacular with garden fresh coriander! Hoping to have my own herb garden soon. Sounds like a great improvement on coleslaw. I've never been into mayo- drenched cabbage! Now my herb garden is growing I'll have plenty of coriander to experiment with, if can be patient a little while longer. With this gorgeous creative I can pretend it's summer all year long! Your slaw sounds like its full of goodies! I love adding peanuts to slaw for a little crunch. And a big thank you to you for brightening my day with your kind words! What a beautiful slaw ( I love the various shades of green flecked with brown!) And it sounds delicious too. I love the bowl, the salad, the combination and I LOVE being able to write a comment!!!! I too love slaws any time of year. This recipe looks and sounds yummy! So true! I'm a sucker for anything with coriander. I've made this slaw before and you're so right. It's way better than the mayo version. I'm glad you enjoyed your romantic moonlit braai. You've got me in the mood for summer to return...I think I'm going to have to make this slaw. that's a delicious looking slaw! love the fresh flavours without a goupy dressing! I know! Aren't goopy dressings the worst? No sriracha to be found, so winged the dressing with fresh garlic and chili sauce last night. The fresh coriander and crunch of the nuts made this an instant hit with the household. Every bit as good as your cool, inviting pic! I love the braai for 2, it's so cosy sitting together around the fire. This is a recipe which will go down well in Stillbaai where we braai just about everyday! i love the simplicity of this dish:) it's so pretty too. I've made this many times since I found your post. I love it so much that I usually eat half of it and then call the family to eat. It is the ONLY slaw the family has ever been willing to eat. @Marilyn - What a lovely comment! So happy that you & your family love this.